Table-Mate the adjustable table that slides to you! Table-Mate the adjustable table that slides to you! 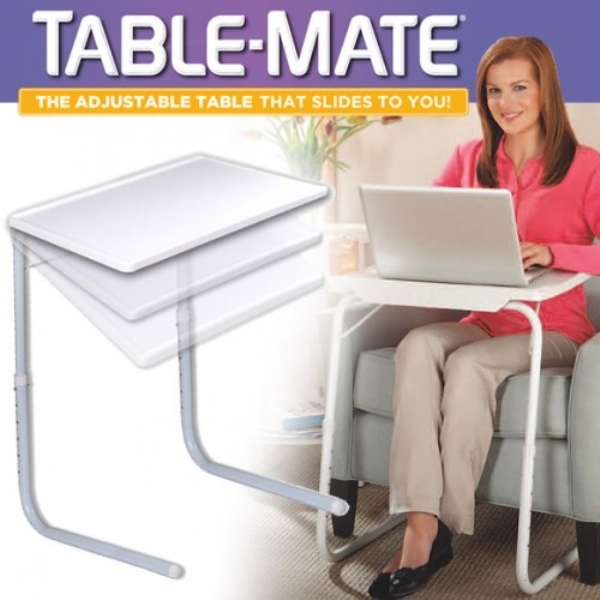 Table-Mate as seen on TV is the perfect portable table, adjusts to six different heights and 3 angles! Features a built-in, adjustable cup holder. The Table Mate folds flat for easy storage or stacks for convenience. Ideal for those with limited space and mobility. Use it for eating, as a laptop computer desk, reading, writing, drawing, board games, arts and craft and much more. Hold up to 50 lbs. 17.5"x20.5"x29", folded 17.5"x20.5"x2.25"
Table-Mate is like having 18 tables in one! Buy today! I purchased this product for my 82 year old Mother who eats her dinner in the living room every evening. She is walker/wheel chair bound and this table is so light she can maneuver it around very easily. It is a very sturdy table and I love the fact that the height is adjustable. WELL WORTH YOUR MONEY! What you see, is what you get on this one folks. love this!! mother-in-law bought for me for christmas!! easy to build and three different levels are great!! WE use this table in our Adult Foster care Home so the residents don&apos;t have to move to the table. They love the ease of the table and the cup holder. We needed a table for my mother who cannot get around very well. She uses it in her bedroom for all kinds of things, like reading the newspaper, reading books, needlework, writing notes, eating a snack, makeup table and many more. I use this for my 98 year old mother so she can eat from her lift chair  the tray fits right up to her so she can keep from dropping food in her lap. It would be good if the holders for the bars held a bit better so they would not slip out of place. Great and simple idea,should have bought one years ago.It&apos;s easy to sit all the way back on the couch and work on my laptop or even eat without having to move all the way forward and be uncomfordable. One con. It could be made more sturdy,it&apos;s a little flimsey. I use it for my lap top computer while watching tv. Problem is at a slight angle the computer slides off the table.Put a higher lip on the bottom or rough up the table surface so items do not slide easerly. This is being used as an end table for my mother who is in a nursing home. It doesn&apos;t take up much room. It is easy to move the get into place. It is light weight which means that it is not as sturdy as it could be, but so far no problems. My mom love it. This product works great as a TV table. I eat on it while I watch TV. Also is good for my laptop use as well as artwork and crafts. I just wish it came in other colors. I use this table-mate in my living room. It&apos;s legs slide under the couch and allow me to adjust the height and angle as I need for specific uses. Perfect for my senior Mom in Assisted Living for puzzles or meals. Very handy. I&apos;m using right now, while reviewing it. Enough said. A welcome and needed addition to my mother&apos;s current situation. This table is lightweight yet sturdy enough (it&apos;s not heavy duty) and its simple design makes it easy to maneuver-it actually slides easily across the carpet which is really a plus. My mother was very pleased so I&apos;m pleased. I really like these tables and the ease of adjusting them. However, I wish they would of put the stickers on the bottom of the tables instead of the room, where they are very much visible and hard to remove. Snap in prongs snapped on both sides during assembly.Table still holds together, Have another table. Will assemble it differently. I am totally satisfied with this purchase. The Table just had a rust spot on the leg. TV table to eat while watching TV.